New home appliances are necessary in order to make your space complete. There are many appliances to choose from, however these are just a few that are a must have for your new home. One of the most important new home appliances is a refrigerator. When buying a refrigerator, it’s important to consider size and type of refrigerator: top-mounted freezer, side-by-side, bottom-mounted freezer and french door. Different features to consider is whether it has an ice maker, dispenses water and alarms when the door is open for too long. A washing machine is one of the most necessary new home appliances unless you intend to regularly visit a laundromat. In addition, size, capacity and energy efficiency are the main features to consider when purchasing a washing machine. Also, whether you would prefer a front loader or top loader. Front loaders are known to be more energy efficient because top loaders must be completely filled with water for wash and rinse cycles. A dishwasher is not one of the vital new home appliances for every home, it largely depends on your lifestyle. Do you have a big family or short on time? If so, a dishwasher becomes one of your most desired new home appliances. Energy efficiency and size are the top things to consider. 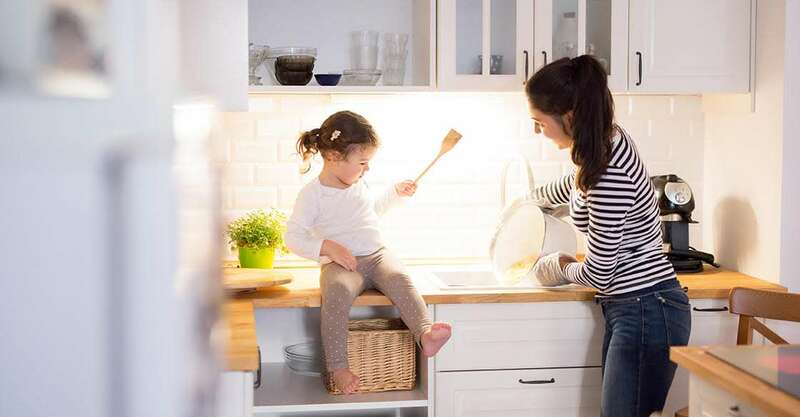 To know whether a dishwasher is energy efficient, you can look for the Environmental Protection Agency (EPA) approved, Energy Star rating system on the front of the machine. One home appliance that you may overlook when buying your new home is a HVAC system. A HVAC system refers to heating, ventilation and air-conditioning system. They are often referred to as ‘split system’ because there are components that function outside the home while other components are kept inside the home. The system cleans the air and offers warm or cool air depending on the climate. Why a HVAC system is great new home appliance? An important benefit of an energy efficient HVAC system is the cost savings. An HVAC system can keep your home heating budget energy efficient. An HVAC systems use less energy to regulate your home’s temperature. The EPA’s Energy Star Program claims that households can save $180 a year by simply setting up their HVAC system with a programmable thermostat. In addition, using less energy consequently reduces your carbon footprint which is a good step to being environmentally friendly. The EPA has claimed that indoor air quality is two to five times worse than outdoor air due to air flow congestion. Polluted air in your home could lead to health issues including causing colds to linger and increase the severity of some allergies. A HVAC system can improve your home’s air quality by circulating the air and regularly replacing the indoor air with outdoor air. Buying a new home is an exciting time in which people sometimes overlook the appliances of their home. All of these appliances are important to have in your new home. They provide home comfort and peace of mind. One of the most important new home appliances that should be on the top of the list is an HVAC system. Your new home should be your abode and an HVAC system will more create comfortability than any other appliance could. Contact Global Heating and Air to learn more about our HVAC systems.